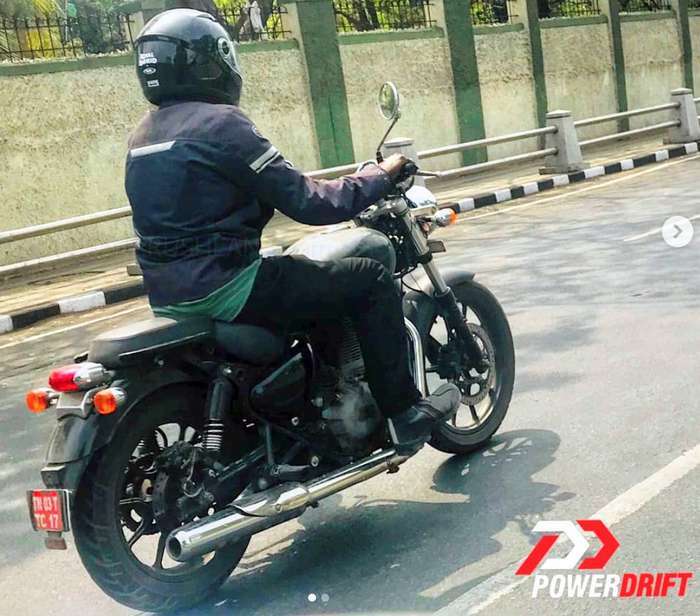 New generation of Royal Enfield Thunderbird motorcycle has started testing on the road. Well, the folks at Royal Enfield sure are busy. Just yesterday, 2019 Royal Enfield Bullet Trials Works Replica 350 and 500 were launched. Simultaneously, spyshots of an 2020 Classic have been doing the rounds. And now the Thunderbird too has been spied testing in Chennai by Powerdrift. 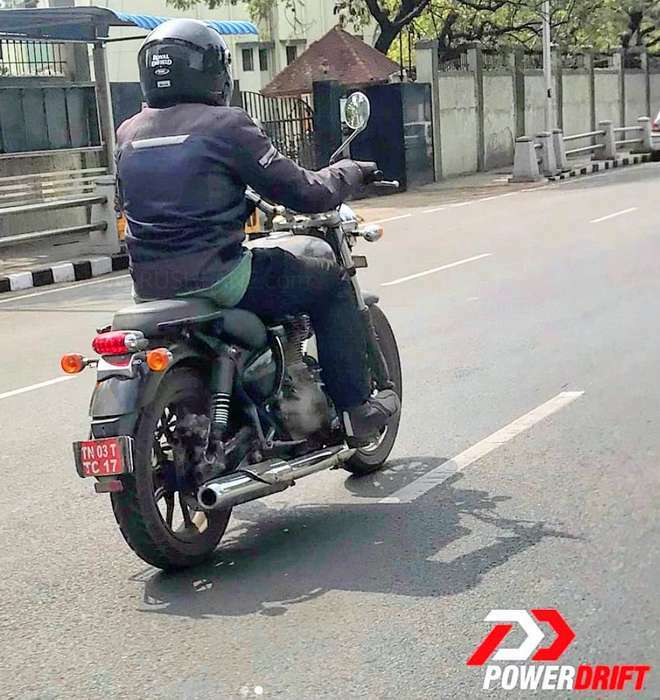 Akin to the new Royal Enfield Classic spied, Thunderbird too sports multiple updates in terms of parts, and mechanicals. 2020 Thunderbird upgrade is likely to retain the blacked-out alloy wheels seen on test, instead of the spoke wheels that feature on current models. In fact, earlier this month Royal Enfield introduced alloy wheels as an accessory option for its Classic and Thunderbird motorcycle range. The 9-spoke alloy wheels are available in black with chrome finish for Rs 10k a pair. The new set of alloys being tested in the new gen TB, vary from the ones seen on Thunderbird X. With Royal Enfield bikes having a fair share of chrome and black bits, that pattern continues. The 2020 Thunderbird on test sees the handle bar ends finished in black, as also the fork ends. Chrome casings can be seen for the position lamps, headlight, taillamp, indicators, mirrors and exhaust. A slight exhaust redesign sees a more pronounced heat shield overlap bit with a rounded edge. The exhaust pipe is in full chrome without a blackened end. In its new avatar, there seems to be a bit of of commonality with the newly spied Classic. Rear nitrox suspension has been replaced with a regular and dated looking shock absorber. Grab rails are redesigned and in black finish, and the rear seat handle is done away with. Seats look unchanged. There’s now a rear disc positioned to the right of the wheel, meaning the chain setup has been positioned to the left, as opposed to the current setup. Akin to the Classic on test, there’s no clear view of a kick-start (assumed to not be there). In all, we could well be looking at a redesigned UCE engine, that is BSVI compliant. Built on a new chassis, the updated Thunderbird 2020 variant is not only going to be lighter in weight, but will also be more powerful. This will translate into better performance. New engine will also deliver less vibrations (like the recently launched 650 Twins). FI and dual ABS will be offered as standard. FI will also help in delivering a refined ride, as well as higher fuel efficiency. Expect launch to take place later this year, or early next year – before the BS6 norms are implemented on 1st April 2020.